This homeowner contacted us due to the loud noise his single speed pool pump was making and was interested in reducing his electrical costs for running the swimming pool. His old Pentair WhisperFlo pool pump was still working though, the pump was making a loud whining noise. This noisy pool pump was caused by the age of the pump and that the bearings were going out. 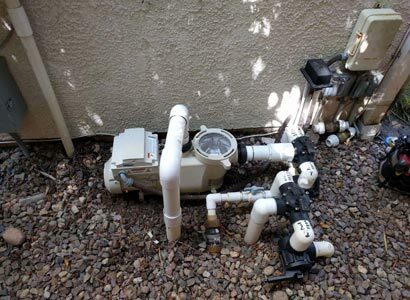 When talking with the homeowner, he had stated that he has had the pool pump repaired previously but the problem came back only a few months later. 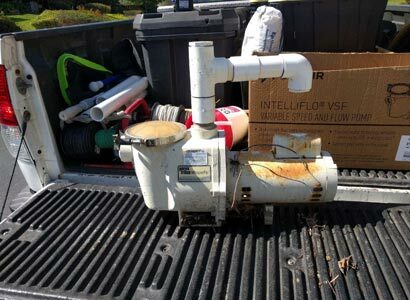 Because of this and the age and condition of the old noisy, single speed pool pump, we recommended going with an energy efficient, variable speed Pentair pump upgrade. This pool pump upgrade in San Diego also allows the customer to benefit from the existing SDG&E rebate program. This energy efficiency program allows customers a $200 rebate when replacing or upgrading your pool pump to a variable speed, energy efficient pump for all San Diego pool owners. We believe the Pentair variable speed, energy efficient pool pump is the best pump and that is what we typically install. This is due to the pumps hold up well and Pentair backs their pool products. Going with a Pentair pool pump was also an easy decision as the old pump was a Pentair WhisperFlo and the plumbing would line up much better. By using this pump, it will allow us to save the customer some money by not having to do much pool pumping to make the pump fit into place. When thinking about upgrading your pool pump, you need to know the law. That is the Title 20 law. This law states that when replacing or upgrading your pool pump, you can use a single speed as long as it is rated a 3/4hp or less or you need to go with a variable speed pool pump upgrade. Your 3/4 hp rated single speed pool pump would be fine if you have a very small pool without any additional water features. This is due to the flow rate and this is why the Pentair variable speed pool pump upgrade is the way to go. If you live in San Diego and are looking or needing to upgrade your pool pump, we can help. We offer new pool pump installation along with pool pump repairs if that applies. We are a licensed pool contractor that offers complete pool repair, and new pool equipment installation. So if you are in need of help or just have a few questions, feel free to contact us for more information or to schedule your pool pump upgrade or any other pool equipment upgrades.